Hey Hey Fellow Peeps, I am back with a new blog. 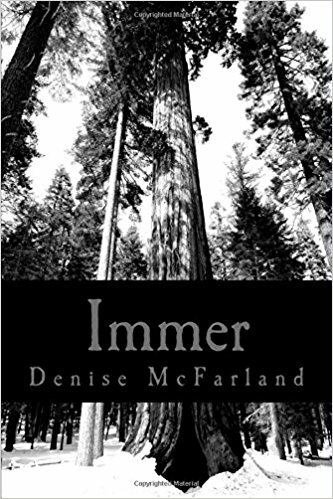 Today I am talking about a book title Immer by Denise McFarland. I was suppose to received this book from a Blog tour but I never did, due to issue. I was still impress by the summary enough, that I bought the Ebook Version. Normally I don’t read Ebooks anymore because I hate Ebook Style but I decided to Purchase this one from Amazon for a dollar. Now onto the Summary and my thoughts. This book is About Rayne Daniels and Will Jaxon. Rayne decides to go out Jogging one day when all of sudden she is grab and dragged into the woods. Will Jaxon is the one who grabs her, but he helps her get away afterwards. It turns out that Will is undercover cop or Special forces Wolf cop as he was describe in the book. After the Kidnapping is reported by Rayne, Will Sends his people to investigate and make sure she is alright. But the Mob or drug dealers won’t dropped Rayne kidnapping, So Will volunteers to go back to keep Rayne from talking. This leads Will to send Rayne into protective custody by Using his friends Ian and Autumn. Ian falls for Rayne, not Knowing that Autumn likes him. But all the while Rayne is falling for Will Jaxon, her mate or her Immer. It all leads to a long drawn out romance danger filled triangle, but to know the ending you actually will have to buy the book. So I rated the book a 3 out of 5 stars and here is why? The Book seem like it was trying to be too many things at Once. It came off as a murder mystery, then went into a romance novel, which was never fully tied off or finish at least to me. Rayne was acting like she didn’t know what she wanted. She was dating Ian Marcus while falling into love with Will Jaxon, at the same time it seem like she wasn’t telling either men that. This whole not telling the men, lasted almost to the end of the book and it bug the heck out of me. Next Rayne seem to get over being Kidnapped faster then Will Jaxon actually did. Will kept being portrayed as the victim while Rayne’s came off as being totally okay, "I am good", after six chapters. The Story first three chapters came off as wham, wham, wham with no real transition between the chapters and no build up to the beginning of the story. Now as for the things I did like about the Story. I love that Will was a wolf and was an alpha. I love the Wolf pack story line and the special forces department. I really love Autumn, the friend because she seem to be all about keeping her friends together. She also was a really huge support for Rayne without the female hate or judgement. I love Rayne towards the end, and how she seem to build as solid Female mate character. I wish though that this has been a typical romance and not what I like to called a “Teenage Romance” where there is no lovely dovey moments just innocent kisses. I will say if you do want to read this book, and like the summary, go buy the Ebook. This story is totally worth a the price Amazon has it listed at as an Ebook. As always thank you for reading this blog. I really hope you check out this book. I will have all of the links listed below for the Author. The world has evolved. Fairies exist and have the power to heal. Vampires are real and aren’t to be trusted. Wolves have revealed their ability to shift into human form. Will Jaxon is both man and wolf. He is the Alpha of his community’s Wolf Force, the agency that provides security and protection for all mankind. In addition to his role as the head of his pack, Will has been working undercover to infiltrate an illegal drug organization that is trafficking women. When Will is coerced to take the lead in an abduction, he agrees in order to preserve his cover. But one look into the terrified, green eyes of the woman he attacks, leaves him powerless to continue. As Rayne Daniels stares into the face of the man restraining her, she sees a shift, for a fraction of a second he changes and his true form is revealed. She realizes he is a wolf, a protector, and almost before she knows what is happening, he releases her. Rayne escapes physically, but emotionally she continues to be haunted, held prisoner by the trauma of that night. When Will discovers that members of the organization are still looking for Rayne, his entire world is altered. Now, Will spends his days undercover and every other free moment keeping Rayne safe, because her survival has become critical to him in a way that he cannot explain. 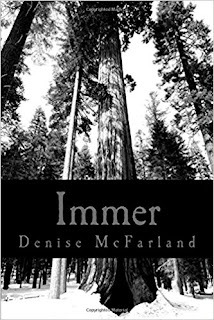 Denise McFarland is thrilled to introduce her very first publication, Immer. As a voracious reader from childhood, she found herself frequently being drawn into paranormal fantasy novels, falling in love with the interesting quirks and powers that made the characters "para" and the stories fantasy. It's not surprising that when she finally jumped into the author pool, she dove toward her favorite genre. She has dreamed for years of being a novelist. So, when she developed a story that she couldn't get out of her head, she knew she had to start typing. Denise is a lifelong resident of Jacksonville, Florida. She spends her summers soaking up the Florida sunshine and the rest of each year teaching 4th grade.